Shop Acquisition Games, Your place for all things ACQUIRE! Welcome to the Acquisition Games Store! Acquisition Games is your place for all things ACQUIRE and the home of MEGAcquire, which is now sold out and no longer available. If you are fortunate enough to own MEGAcquire, we still offer various enhancements for your MEGAcquire game, such as Wild Tile Kits, the 1963 World Map Conversion Kits, and last, but not least, MEGAcquire T-Shirts! For ACQUIRE enthusiasts, we offer various enhancements for your ACQUIRE Game designed to greatly improve your ACQUIRE-playing experience. In addition, if you need them, we carry replacement parts for most of your vintage ACQUIRE games. We also have a limited amount of vintage ACQUIRE games in stock. 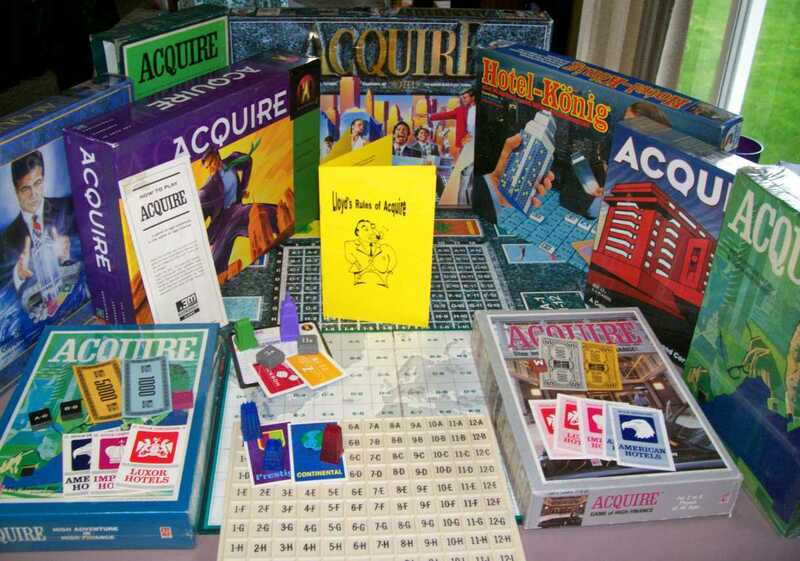 If you would like to read about the various versions of ACQUIRE that have been produced over the years, please visit our History of ACQUIRE pages. At this time we accept PayPal only. If you do not have a PayPal account, you can still log in to PayPal as a guest to use your debit or credit card for payment. Enjoy browsing our store and thank you for shopping Acquisition Games!